At 6 years old, Scout has IVDD and became acutely paralyzed. With no movement or deep pain perception in his rear leg, his owners were considering putting him to sleep. Stem cell injections literally saved his life and restored his walking within 30 days! Stem cells regenerate the cartilage that the discs are made of and draw moisture back inside the disc and the discs become like new again. 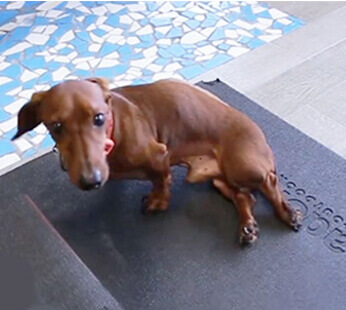 Although IVDD affects all breeds of dogs, as many as 1 in 5 miniature Dachshunds will suffer from the pain and impairment of disk compression. Intervertebral Disc Disease (IVDD) is a neurologic disorder where the discs between the vertebrae harden and become brittle and can no longer cushion the vertebrae. Thereby, the discs flatten or bulge and can burst, leaking their hardened contents into the area surrounding the spinal cord. When this happens, it puts pressure on the spinal cord and can squeeze the nerves enough to cause pain. As a result, loss of certain functions such as bowel and bladder control, or even paralysis, can occur. Breeds genetically predisposed to IVDD classified as Chondrodystrophic dogs (dogs with Hereditary Dwarfism) are the Bassett Hound, Beagle, Bulldog, Cocker Spaniel, Corgi, Dachshund, French Bulldog, Lhasa Apso, Pekinese, Pomeranian, Poodle, Pug, and Shih Tzu. Non-Chondrodystrophic breeds include the Doberman Pinscher, German Shepherd and Labrador Retriever. Overweight dogs are at a higher risk of herniated discs. Many dogs receiving conservative treatments often progress to full paralysis or require surgery which can be costly. Your pet can be treated with stem cell injections, too! With one or two stem cell injections into the bad discs and/or the spinal canal, normal function can be restored!